If you are looking for a charming house, a countryside house or luxury villa with pool in the city of Dubrovnik you can find all of these across Dubrovnik riviera. This part of Croatia is famous for pleasant weather, amazing architecture and top quality cuisine. If you are searching for a place for your family holiday or friends escape you should book one of numerous Dubrovnik villas in this area. Most of them are set in secluded locations, among Mediterranean greenery. They are ideal for relaxed peaceful holiday away from city crowds. In these villas you have everything you may need during your holidays. Each villa has outdoor area usually with pool equipped with deck chairs all around. Some villas have barbecue area where you can prepare food from local sources. 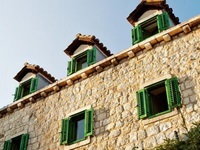 If you want to be close to the city to explore historical sights, you should rent villas in the city of Dubrovnik. Otherwise, you can rent villas in the surrounding areas like Konavle region or Cavtat as well as northwestern of Dubrovnik in Dubrovacko primorje and nearby Elaphite islands. Staying in these villas you can enjoy peace of countryside and be in the city in a short car ride. Experience the holiday of your dreams, enjoy the luxury and comfort offered by luxury villas and villas with pools. These luxury villas will offer you a beautiful holiday close to the crystal clear Adriatic sea, or surround you with beauty and peace of clean, unspoiled nature which exudes history and tradition. This five-bedroom villa is located in the great peaceful location on Babin Kuk peninsula. It can accommodate up to 9 people. Villa features spacious outdoor area where you will find outdoor pool and deck chairs. From the villa you can enjoy sea views and amazing summer sunsets. Villa has big kitchen and dining area where you enjoy prepared meals. This villa has a great location south of the Old Town, only a short walk from two beautiful city beaches: Saint James beach and Banje beach. Villa is set in typical Mediterranean stone house with outdoor area equipped with sun loungers. The property can accommodate up to 8 people. From the villa you can enjoy amazing views over the Old Harbour and city walls. This spacious villa is situated only 5 minute walk from the Old Town. It can accommodate up to 14 people. Villa Orti features fully equipped kitchen with dining room, living room with fireplace, 7 double bedrooms (with bathrooms), outdoor pool with showers, sauna with shower and toilet, equipped meeting room, outside grill, laundry room and separate wine cellar. There is also a garage with 4 parking spaces. This amazing holiday home is located only a short car ride from the city of Dubrovnik. Villa Aridea can accommodate up to 6 people. Spacious outdoor area with pool and deck chairs makes this property ideal for relaxed summer holidays. Free private parking is available on site and free Wi-Fi is provided throughout the property. This luxurious villa is set in the typical Mediterranean stone house only short walk from historic Old Town. It is surrounded by lush Mediterranean garden. The ground floor features two suites with en-suite bathroom, a large join salon with a toilette and completely equipped kitchen. The upper floor of the house features 3 suites with bathrooms - two of them have a large sunny terraces. The villa holds a mini gym, a sauna and a laundry room in basement. This 3-bedroom villa is situated on a hill in Mlini, just 10-15 minutes' driving distance from Dubrovnik's Old Town. With a generous 220m2 of interior space over two floors, villa can comfortably accommodate up to 8 guests. A spacious outdoor terrace boasts a swimming pool, 6 sun loungers, a dining table and a summer kitchen with stone barbeque. The villa is sourrounded by a rich assortment of Mediterranean plants such as orange, lemon and olive trees which create a relaxing setting. This spacious villa is situated in the village of Zaton, 9 km from the city of Dubrovnik. Villa Sana Via has two floors. In total there are 2 double bedrooms, studio apartment, 3 bathrooms and is suitable for up to 8 guests. Stepping out from the first floor you are on the terrace furnished with teak chairs and table for 8 people next to barbecue. Stairs lead to the lower level where you will find a swimming pool with Jacuzzi, outdoor shower, deck chairs and umbrellas. From the terrace and pool area you can enjoy amazing views over the bay and crystal clear Adriatic sea. Villa Pugliesi is situated in a picturesque Zaton bay just 10 minutes driving from Dubrovnik. This stunning villa is a unique property set in a historical building from 16th century. Villa Pugliesi provides its guests with everything they need for the perfect holiday. The main building of 500 m2 spread over two floors and in the back of the villa extends beautiful Mediterranean garden which houses a swimming pool and even a private chapel of St Jerome. This exclusive 5-star villa is situated on the hill above Mlini bay, only 15 minutes driving distance from the city of Dubrovnik. This amazing villa extends over three floors and includes four bedrooms and five bathrooms with the total capacity of 12 guests. On the ground floor guests can relax in private indoor/outdoor swimming pool which is equipped with a whirlpool, jacuzzi and pool bar. There is also sauna, fitness equipment and a mini wellness center. This 5-bedroom villa is situated only a short walk from the Old Town and all Dubrovnik sights. It is located in the peaceful and quiet area only 300 metres from the sea. Villa can accommodate up to 10 people. This air-conditioned villa features 5 bedrooms, a well equipped kitchen with a dining area and a living room. Large outdoor terrace which is surrounded by Mediterranean garden for relaxing during hot summer days. This spacious villa is situated in the area of Rijeka Dubrovacka, only 6 km from historic Old Town. With its 4 bedrooms it can accommodate up to 8 people. Villa has large outdoor area with pool and deckchairs as well as terrace with dining area. If you want to stay fit there is a gym inside the house as well as playroom. This villa is ideal for peaceful and relaxed family escape to the Mediterranean. Even though the villa is located a mere 3 kilometres from the historic Old Town of Dubrovnik the natural surroundings of typical Dalmatian flora and fauna offer complete privacy and relaxation. Villa franco presents the height of comfort with a total of five rooms located over 3 levels which are all fully air-conditioned and centrally heated. The villas inviting swimming pool is ideal for keeping cool during Dubrovnik’s warm summer months and lies partly in the shade of soaring palm trees.